Width of the "clime" zones. Extra meridian methods for latitude determination. Instrument lying on the plane. Solution of higher order equations. Libro de Algebra: Letter to the Reader. The instrument lying on the plane allowed an observer to obtain the height of the sun without having to point directly to it. The basic concept was that of a gnomon. The problem of vertical shadows is that the length of the shadow projected by the gnomon is proportional to the co-tangent of the angular height, which introduces a non-linearity to the scale. Pedro Nunes devised this solution in order to convert the reading of the angle into a circular scale. 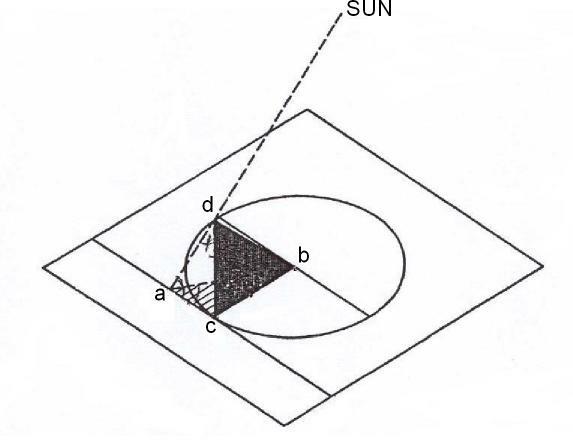 The height (altura) of the sun, that is the shadow abc (or alternatively the zenith distance), could be read in the circular scale cd. This instrument was in fact used aboard by João de Castro in a expedition to the Red Sea. In spite of the good readings obtained by Castro, this instrument was not welcome among mariners. The main reason was that, in order to give good readings, the instrument should lay on a stable, horizontal surface, which was only possible in calm days or when in land.